AquaBlok, Ltd. provides a range of patented products to address many common remediation challenges. All our products utilize a composite particle technology that consists of a coated core (typically stone aggregate). The particles act as a delivery system placing fine-grained active ingredients through a water column or to appropriate target locations. AquaBlok® is a proven technology with 200 full-scale applications performed over the past decade. AquaBlok will form a very low-permeability isolation barrier over contaminated sediments in a layer thickness of 6in or less. 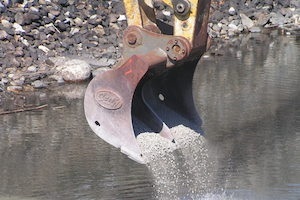 This provides greater relative sequestration than many feet of sand or similar capping material. AquaGate®+ provides a means to improve the performance and reduce costs of organoclay, powdered activated carbon, and other amendment materials in aquatic settings. AquaGate+ can be used alone or in combination to provide an approach (Funnel & Gate) to address groundwater upwelling or gas ebullition contaminant transport. 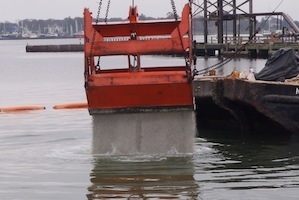 Post-dredging residual contamination can be addressed with either a sand and AquaGate+ approach for treatment or an AquaBlok sequestration approach with greater erosion resistance. AquaGate+ materials provide a lower cost means to obtain greater effective residence time when using a PRB approach. A low-permeability AquaBlok layer “funnels” groundwater and contaminants through a permeable zone consisting of AquaGate+ treatment/amendment materials. This approach, common for groundwater remediation, minimizes the potential for contaminant breakthrough of the active treatment material and reduces costs. 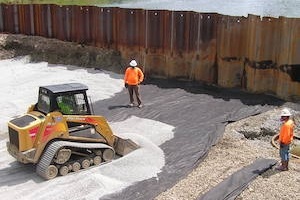 HoleBlok™ and HoleBlok+™ provide improved annular sealant materials that provide pollution prevention together with a range of other benefits, including contaminant “rebound,” over conventional coated bentonite pellets or chips. Effective management of contaminated sediments is a complex and challenging process that may involve a range of alternatives. An integration of AquaBlok with more conventional management technologies may offer the best solution.